“Go, find a spot to sit in. Don’t see much here? Wait. […] Everything is green. Everything is waiting and still. Slowly things begin to move, to slip into their places. Groups and masses and lines tie themselves together. Colours you had not noticed come out, timidly or boldly. In and out, in and out your eye passes. Nothing is crowded; there is living space for all. Air moves between each leaf. Sunlight plays and dances. Nothing is still now. Life is sweeping through the spaces. Everything is alive. The air is alive. The silence is full of sound. The green is full of colour. Light and dark chase each other. Here is a picture, a complete thought, and there another and there..."
So invites Emily Carr, introducing both her readers and her viewers to a space of worship. The majority of her audience had little familiarity with the tangled rainforest that surrounded the Canadian West Coast colonies. Yet despite the censure and scorn Carr evoked for venturing into this wilderness, she was convinced that there was something there of God that could not be found in the city – and so she continued to craft introductions and invitations with both paint and pen. Referencing Psalm 132 Carr explains that it is the “the holiness and quiet” of this space – “God in his woods’ tabernacle” – that she seeks to express, desiring “to paint so simply that the common ordinary people would understand and see something of God.” She muses: “Christ said ‘I come that you might have life, and have it more abundantly.’ Having Christ in one’s life should awaken one to a far bigger sense of life.” Wood Interior (1909), painted when Carr was almost 40, calls the viewer into that bigger sense. Although Carr was still developing her own artistic expression, her invitation is evident as shafts of light and life reach through the majestic forest illuming mysterious paths. Simply entering that cathedral of cedar was not enough for Carr: she recognized her desire to respond to the expression of God’s creation as “the growth in our souls, asking us to feed it with experience filtered through us. We are very lazy experiencers, content with the surface instead of digging down.” Carr believed that much Western art stayed on that surface in a manner quite antithetical to the Indigenous art of Canada’s Pacific Northwest. Carr was uniquely privileged in her introduction to the latter, her guides being First-Nation friends who taught her how inextricable their visual art was from their legends and how both were informed by an intimacy with their environment. Carr’s initial approach to Indigenous art was primarily to record it. Yet the decades of carefully replicating those ancient expressions tutored her as she sought her own artistic voice. At the age of 57 an inspiring encounter with the Group of Seven enabled Carr to dig down through the surface in a new way and then her most productive period began. Her work continued to introduce and invite, but now the invitation itself was a more personally authentic response to God’s grandeur. Carr writes that in the painting Big Raven (1931) she sought to express the great loneliness and quiet power she had perceived in this totem and its particular setting. The totem had been carved to mark a place where many Haida once died of small pox. In Haida legend Raven is a colourful character with both creation and trickster myths, yet also the giver of light to humanity. Carr portrays the solitary creature pressing forward towards the renewal, the resurrection, that was so crucial to her own grasp of the Divine; rays of light pushing through the darkness. Carr is no longer an archivist presenting the creative work of a carver long dead. Extensive intimacy with Indigenous art, a lifetime of learning to delve deeper, and the permission and encouragement that she received after meeting the Group of Seven all had better enabled her personal expression. In studying the response of others to the creation that she so dearly loved, growth in her soul had been fed. Perhaps attentiveness to Carr’s art can do the same for us: assist us in learning how to express more authentically our own response to creation. But the invitation is not to “stay outside and talk about its beauty”, rather to enter in and breathe. Emily Carr: Wood Interior, 1909, watercolour and graphite on paper,72.5 cm x 54.3 cm, collection of the VancouverArtGallery. 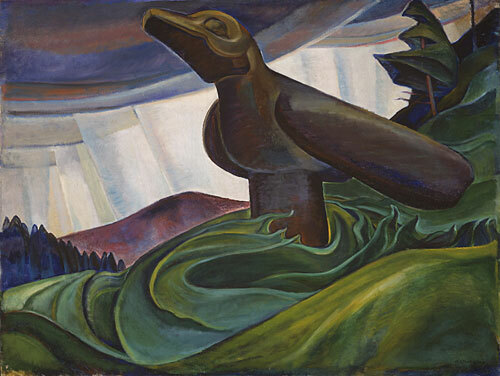 Emily Carr: Big Raven, 1931, oil on canvas, 87 x 114 cm, collection of the VancouverArtGallery. Emily Carr (1871-1945) was born the same year her home region of British Colombia became an independent Canadian province. Despite rebellion against rote practices and cultural hypocrisies in her church upbringing, struggles with doubt and passing interests in Transcendentalism and Theosophy, Carr determined that she needed a relationship with Christ. Named Klee Wyck (the Laughing One) by her Native friends, she could also be curmudgeonly and cantankerous. She spent much time apart from society. Nonetheless Carr was very aware that she could not find her own true expression without engaging with that of others and so pursued education and exposure in San Francisco, London, St Ives, Paris and rural France. She experimented with numerous trends in modernism – such as Post-Impressionism, Fauvism and Cubism – but her two dominant and often interwoven themes remained the same: the forested West Coast and the art of its First Peoples. In 1927 Carr met and was greatly encouraged by the Group of Seven, artists in Eastern Canadawho pursued a distinctly Canadian response to nature. After this she produced most of her best-known work. During Carr’s lifetime the general populace more readily received her published writings than her visual art and in 1942 her book Klee Wyck was awarded the Governor General’s Award for Literature. Today, however, Carr is one of Canada’s most renowned visual artists. * Hundreds and Thousands: The Journals of Emily Carr, Douglas & McIntyre, 2007. 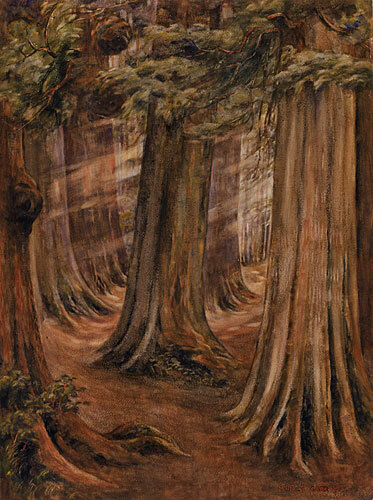 * “Winds Of Heaven: Emily Carr, Carvers & The Spirits Of The Forest” (a film), http://carrdoc.wordpress.com. * Vancouver Art Gallery’s “Emily Carr Website”: http://www.museevirtuel-virtualmuseum.ca/sgc-cms/expositions-exhibitions/emily_carr/. * “God’s Grandeur” by Gerard Manley Hopkins: www.bartleby.com/122/7.html. Kirstin Jeffrey Johnson completed her doctorate on the mythopoeic art of George MacDonald at the Institute for Theology, Imagination and the Arts, University of St. Andrews, Scotland. A free-lance writer and lecturer, she lives on a farm in the Ottawa Valley, Canada. See www.kirstinjeffreyjohnson.com. - From June 30, 2010 – June 30, 2015 the exhibition ‘Emily Carr: On the Edge of Nowhere’ can be seen in the ArtGallery of GreaterVictoria, B.C., Canada. See http://aggv.ca/exhibitions/emily-carr-on-the-edge-of-nowhere. - From July 20, 2013 – March 9, 2014 the exhibition ‘Emily Carr in Haida Gwaii’ is on view in the VancouverArtGallery. See www.vanartgallery.bc.ca/the_exhibitions/exhibit_carr_haida.html.